And it has landed on Melbourne's Chapel Street. Chapel Street has welcomed another burger joint into the fold, this time it's part of the internationally renowned RocoMamas stable. The Windsor restaurant marks the South African group's Australian debut, with the space boasting an edgy combination of neon lighting, polished concrete and street art by Sabine Kahwati. 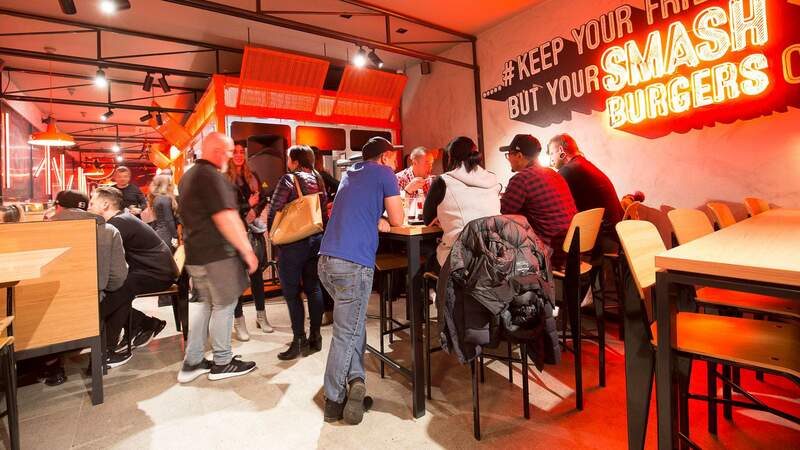 Here, RocoMamas is treating locals to their first taste of its signature 'smashed burgers', where each meat patty is rolled into a ball and then squashed flat onto the grill to lock in the juices. Choose yours crafted from beef, chicken or a meat-free ensemble. House iterations include the Rock Star, with swiss cheese, barbecue relish and RocoMamas' own mayo, the Old Skool combination of tomato, onion and special sauce, and the no-holds-barred Chilli Cheez Bomb, loaded with bacon, cheddar, mozzarella, fresh chilli and a house-made cheese croquette. Otherwise, go the DIY route and customise your ultimate smash creation from a sprawling list of burger additions. Elsewhere on the menu, you'll find all the usual suspects — flame-grilled pork, beef and lamb ribs, loaded fries, onion rings, and chicken wings in varying degrees of mouth-burn. To match, there's a full bar offering — with local beers, wine and cocktails — as well as a line of decadent custard shakes. Find RocoMamas' Australian store at 156 Chapel Street, Windsor.